Hmm, or someone competent could maybe fix these two security issues? Outstanding, I can't wait for the next episode! It'll be till end of this summer - we need some flashback scenes which are set in summer, so it can't be rushed unfortunately, though 90% of the second episode is already filmed and cut. Really really nice job Thorsten! For those of you who are into this, Katharina has started a Facebook page where you can follow our work. Or, if you prefer something more old-fashioned, there's always our newsletter. 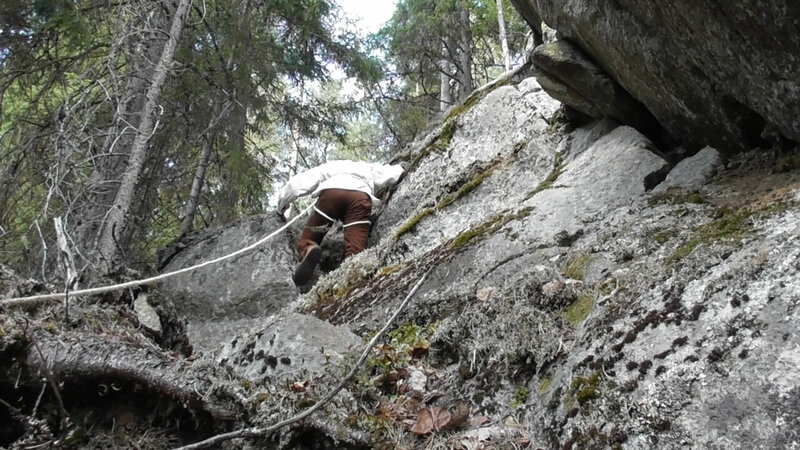 Yes, we more or less actually did this - I have some experience rock climbing, so we went right into things with a makeshift rope harness and the camera and had a rather adventurous (and somewhat exhausting) movie-making session. Result maybe in less digital appearance of some pictures. Part of what Michat refers to as a "digital appearance" might be the lack of foreground - middleground - background separation in pretty much the entire "Clíodhna - the witch of Gleann an Phéine" teaser, due to closed aperture/large f-stop number. For example, at 0:21 a guy is walking away from a line of trees. The interesting thing is the guy, so he should be in focus, and the background trees should be out of focus. Or at 0:58, where there's a guy in the foreground really close to the camera, a girl speaking in the middle, and trees in the back, all of which pretty much fully in focus. In a professional video production, at least one of these would be out-of-focus to draw your attention to the important part of the scene. To get this effect, obviously you either need somewhat expensive equipment, namely something like a 200mm f/1.8 lens, or do a ton of post-processing, probably using sophisticated aka. expensive video software. I understand that neither of which might be feasible. I've occasionally wished to have the option to change aperture, but as you suspect, the camera isn't up to it. I do disagree with the notion that this is generally done in professional productions though - just checking screenshots from two different fantasy movies, in 'Willow' the background is indeed out of focus at times, in LOTR I could not see a shot in which this was the case. Yeah, I didn't mean to say it's done always. Maybe my point was to express what I perceive as "digital appearance", for the lack of a better word -- and I'm not meaning to belittle your work, nor say that I could do it better or even as good. What formed my perception was the tidal wave of digital photos that came with the advent of cheap digital cameras and then crappy smartphone cameras. Back then many users were not aware of depth of field or how to control it, and even if they were, due to their camera's tiny sensors and lenses they couldn't achieve anything but a deep focus. But I'm preaching to the converted here. Fingers crossed you sell tons of DVDs! I get the point (I hope) - and upon reflection, LOTR also has a more digital appearance as Willow, so you may actually have nailed that spot on. Good point, that would literally add another dimension. What i wand to say back in Feb is that the green/blue screen effect need some feathering and some color correction. (I know, the second episode isn't even out yet, but we've moved to post-production with it and I'm currently heavily into sound-editing - it's still scheduled to appear late summer). As always, if you like what you see please spread the word, it's hard for independent movie-makers to get noticed. Also, I've edited the first post in the thread to gather all material in one place.